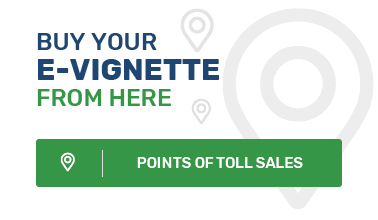 Which vehicles do NOT have to pay e-vignette? Vignette fee is not due by persons with 50 or over 50 per cent of disabilities, as well as persons or families bringing up permanently disabled children under 18 and until completion of a secondary course of education, but not later than till their 20 year of age. These persons are granted free e- vignette with validity of one year. Vignette fee is not due also for vehicles with less than 4 wheels, as well as for wheel tractors, tractor trailers and other self-propelled machinery registered for work under the Law for registration and control of the agricultural and forestry machinery. Vehicles owned by the Ministry of Interior, the National security service, the State Agency “National security”, the Emergency medical care and the Armed forces do not pay vignette charge as well.